macOS Sierra enters the fray as a solid, dependable operating system just like the final two versions of OS X. It offers clear benefits when used in conjunction with iPhones and Apple Watches, while the addition of Siri and iCloud Drive are a boon for working with files and retrieving information on the desktop. It’s no longer the newest or prettiest model, but macOS Sierra still holds up, even amid the widespread Spectre vulnerabilities inhibiting all of Apple’s Mac computers. In fact, Apple has already patched Safari in macOS Sierra, macOS High Sierra and macOS El Capitan as of January 20, 2018. So you can be sure that your Mac is secure simply by updating to version 47 of Safari Technology Preview. At the time of writing, however, you shouldn’t be using macOS Sierra anyway. Instead, we would recommend that you head on over to the Mac App Store and subsequently download and install macOS 10.13 High Sierra. But, as macOS 10.12 Sierra formerly occupied the Mac operating system throne, let’s take a look at its existing features and recent developments prior to the release of version 10.13. Apple tends to release new versions of macOS with a "tick, tock" cadence. Back in 2009 it followed up OS X 10.5 Leopard, which introduced hundreds of new features and improvements, with Snow Leopard – a performance-focused update. It repeated the trick with Sierra's predecessor, OS X 10.11 El Capitan, which was basically a much faster version of Yosemite with a few new multitasking features baked in for good measure. It also makes a clear attempt at swinging the focus back to new functionality and features, rather than performance. Sierra places a firm focus on usability while allowing you to be more productive on the desktop - especially so if you use your Mac in conjunction with Apple's mobile devices. Whether you're clasping a shiny new iPhone X or Apple Watch 3 in your hand, Apple wants to make you feel like your investments are more than the sum of their parts. Clearly this is something of a double-edged sword, as Mac owners that don't own them are bound to feel like they're missing out. Not prepared to buy more Apple products? Then the message is clear: you're not getting the full experience. It almost feels churlish to moan, however, as Sierra continues tradition by leaping from the App Store onto your machine for the princely sum of nothing – just like every version of macOS has been since OS X 10.9 Mavericks. A word of warning, though: be sure to check out Sierra's system requirements before you hit the download button, as they are notably more taxing than what has gone before. Over six months ago, we swore off macOS 10.12 Sierra in favor of the formidable macOS 10.13 High Sierra. Initially revealed at the Worldwide Developers Conference (WWDC) held in San Jose, California, macOS 10.13 High Sierra has been outfitted with a helping of iterative features as well as four different public betas as of January 2018. Of the former, we consider the most important of the bunch to be consistently enforced EFI security checks, a more comprehensive catalog of photo editing tools and support for VR. Of course, that support won’t be present until Thunderbolt 3-powered external graphics cards are more widely supported by macOS 10.13 High Sierra, so if you want to stick with regular Sierra in the meantime, we wouldn’t necessarily blame you for doing so. 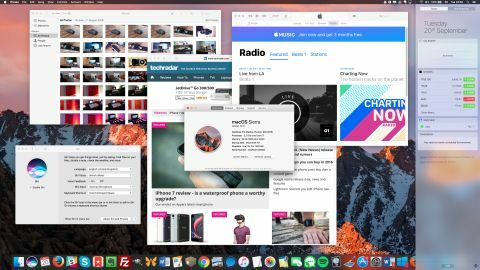 macOS 10.12 Sierra may be yesterday’s news, but as its already received its final installment of substantial updates, you can rest easy knowing confidently that it’s going to be a stable experience from here on out. And although Apple itself has declared macOS Sierra threatened by the recent swarm of Spectre vulnerabilities, we would argue it’s still one of your safest bets. With Siri's arrival on the Mac, owners of Apple's computers no longer have to look at iPhone, iPad and Apple Watch owners with envy. Apple's personal assistant is arguably even more useful on the Mac than it is on the company's mobile platforms as you can drag and drop Siri's search results from the Notifications pane and into other apps for sharing or accessing on a later date. Those results include images pulled from the web, which appear as thumbnails along the right-hand edge. Siri can also retrieve other information as part of searches, including maps results, location data and user reviews courtesy of Yelp. As far as its basic operation goes, Siri works just the same on the Mac as it does on other devices. You click the purple icon in the top right-hand corner, instead of holding a button, before speaking into your Mac's microphone. You're given a five second window before Siri gives you what can only be described as a digital nudge and reminds you of what phrases you can ask. You can also retrieve a list of actions that Siri can perform by simply asking, "What can you do?". Some are basic, such as asking Siri to open a folder on the Mac or launch an app. It's also possible to start a FaceTime call, set up a meeting using the macOS Calendar, or find photos from a particular date. If you're a social media addict, the ability to post updates to Twitter and Facebook could prove a big time-saver. So, how well does it work? Very, in fact: Siri's voice recognition engine is near-flawless. Even in my strong regional accent, it picked up what I was saying almost every time. Siri only struggled with words that sound the same but are spelled differently. For example, she repeatedly failed to distinguish the difference between questions based around the country Wales, and ones about whales. How's the weather in London on Saturday? It's now possible to use tabs in any almost application, whereas El Capitan restricted them to OS-specific apps such as Safari, and Finder. Apple's apps that support tabs from the off include Mail, Maps, TextEdit and the three iWork apps - Pages, Numbers and Keynote. Apple says that you can open tabs in any app without the need for extra coding from developers, but that depends. That is the case where the app can open multiple windows, but you aren't suddenly going to be flicking through tabs in ones like Spotify, Ulysses or Evernote, which already have their own sidebar-based navigation systems. Apps that currently support tabs let you activate tabs using the View menu. The obvious benefit here is that you don't have to open as many new windows to multi-task, which comes in especially useful in split screen mode. For example, somebody writing up an essay could position Safari (or any other browser) on the left and Pages on the right. Previously it would have only been possible to view one website at a time in full screen mode, whereas tabs allow multiple webpages to be opened. This can be particularly useful when used in conjunction with note-taking services such as Evernote. Suddenly it's possible to flick between multiple notes open in various tabs for retrieving information while maximizing the amount of information that can be displayed on the other half of the screen. It's especially useful for owners of Apple's Macs that don't offer much real estate - including both sizes of its MacBook Air and even the 12-inch MacBook.